This is the 2nd of 208 Chelmsford photos. Caption for Chelmsford, High Street 1969: Bond's - its name in chunky 1960s lettering - is here designated 'A Debenham Store'. During the 70s it became simply Debenhams. 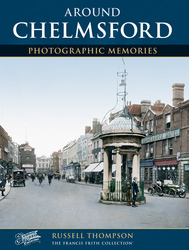 An extract from Chelmsford Photographic Memories. This is the view looking down the High Street, and you can see four cars parked on the left hand side of the road outside a large store. You can just make out the name, Bonds. This was in fact J. G. Bonds which has long since gone and is now the site for the Debenhams present-day store. Add a memory of Chelmsford. 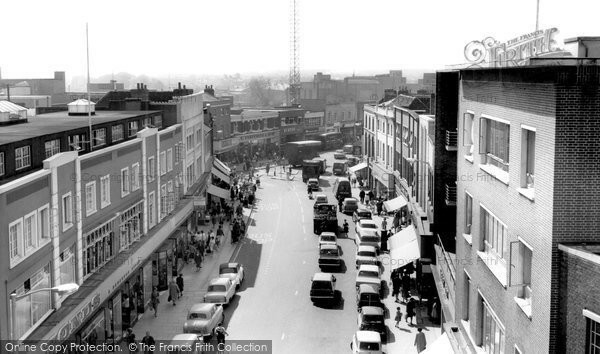 Buy "Chelmsford, High Street 1969" Available as a print, mounted, framed, or on canvas.